There are many factors that go into planning an event, especially when it comes to selecting the venue. With this in mind, we have created the premier event space in San Diego for hosting weddings, birthdays, anniversary parties, and corporate events. With an amazing and unique ambiance, an award-winning event team, and a “wow factor” that makes it perfect for any type of event, deck655 is the perfect San Diego event venue. 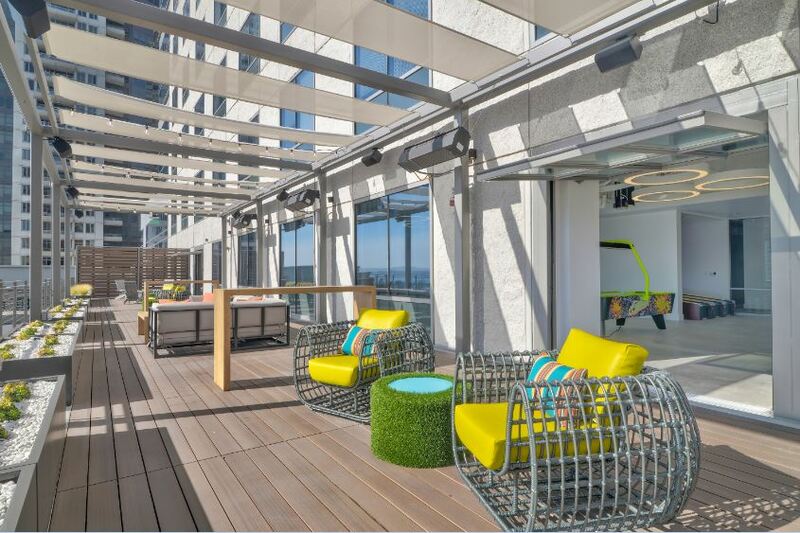 Located just on the edge of Downtown San Diego (Kettner & W. Broadway), deck655 is a versatile venue that can be customized for social or corporate events. With 8,500 square feet of contemporary indoor/outdoor space, deck655 features a spacious indoor game room and outdoor amphitheater-style seating for up to 110 guests. Also featured are 50 / 50 doors that open to a 125' promenade deck with sweeping views from Point Loma to Coronado. Our party venue in San Diego is designed to make your event very memorable, whether it is a business function, wedding reception, or anniversary party. You and your guests will feel right at home with the inviting layout, generous amenities, and sleek decor. Our city view and party environment makes us stand out among indoor and outdoor wedding Venues in San Diego and we would love for you to book with us. We will provide ideas and inspiration for your event, and will help you plan your perfect party at our location. Our stunning venue features patios with lounge furniture, built-in heating, lighting, surround sound, and more... all to create a perfect environment for entertaining up to 350 guests. Picture your attendees enjoying the night air, relaxing on the deck, and gathering inside to grab a handcrafted cocktail or hit the dance floor. Once inside, our game room lets guests let loose and compete in popular arcade favorites. For dining, the banquet room can be configured with a formal layout or more casual arrangement. With Gaslamp District hotels in walking distance, your family, friends, or colleagues will be well taken care of. Connect with us about booking our Downtown San Diego wedding venue and reserving your date. We are happy to provide a tour or answer any questions you may have. We know how challenging it can be to plan for a big event like reception, wedding anniversary party, and corporate events. At deck655, our in-house team of award-winning event planners has made planning and executing your event extremely easy. We are now booking events and social functions for calendar dates throughout 2019 - 2020. Reserve deck655 for your party, wedding, or corporate event in San Diego. Wonderfully executed open spaces perfect for all types of events! Great space with unique views and strong team of producers and vendors! Questions Regarding Our San Diego Event Venue?